The Santa Barbara County Sheriff’s Office would like to take this opportunity during National Public Safety Telecommunicators Week to recognize and say thank you to the highly trained, professional and compassionate team of public safety dispatchers at the Santa Barbara County Public Safety Dispatch Center. These dedicated professionals work around the clock to ensure that community members get the help and resources they need as quickly as possible. They are a “Life Line” not only to the community members who are calling for help, but also to the first responders who rely on them for accurate and detailed information. Most people will only have the need to call 911 once in their lifetime, but it may be the most important call they ever make. Our county dispatchers are the calm voice on the other end of the line who provide lifesaving advice and instruction to callers in times of crisis. They are the first and most critical contact our citizens have with emergency services. They provide a vital link for our Sheriff’s Deputies, Firefighters, EMTs, Paramedics, Custody Deputies, Probation Officers, and more. In 2018, Santa Barbara County dispatched 141,003 Law Enforcement calls for service, 16,995 Fire Incidents and 44,421 AMR Medical Incidents for an average of 555 calls each day. Dispatchers answered 311,214 telephone calls in 2018 for an average of 853 per day. Additionally, five Santa Barbara County Dispatchers received life-saving awards from the Emergency Medical Services Agency for CPR saves and five for assisting with delivering a baby. These recognized dispatchers had direct involvement in the chain of survival for cardiac arrest patients and childbirth. The process of becoming a dispatcher is a challenging one. Dispatchers undergo a rigorous testing and background process followed by months of intense training and then a period of on-the-job training before they work independently. 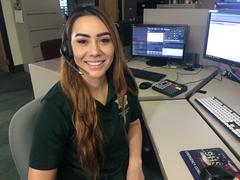 If you are interested in making a difference and serving your community in this way, go to our website at www.sbsheriff.org and click on the Join Us section to find out more about applying to become a dispatcher or 9-1-1 call taker. Thank you to all of our dispatchers for the incredible work you do behind the scenes to ensure that our community members are protected and that our deputies and other first responders go home safely to their loved ones.